Master your team's set plays and recognize when and where there are great scoring opportunities for yourself. It could be a play designed specifically for you or for another teammate, but you always need to be ready to take a high percentage shot within the offense. Don't be a robot when running plays. Understand how the defense is guarding a certain action, and then exploit it. This requires knowing and understanding each play at a high level. If you are always trying to remember the play you wont be able to read the defense. You must value the shots that you shoot. Not every shot is a good shot. Look for high percentage shots to take advantage of. Every scorer has different spots on the floor that they prefer. So get the ball where you want it, and then shoot the shot that you want. Don't try to do it on your own. i.e. If you are great with ball screens, look to use a ball screen with one of your post players to score. Communicate with your teammates and let them know where you want to get the ball. Not every shot is going to go in, it is just how it works. However, you should never let a miss impact the next shot. Move on to the next play and shoot the next shot with confidence. You must be mentally tough and have confidence in your abilities. Don't allow a few misses to deter you from taking the next quality shot that comes your way (time and score). Sprint the floor and look to get easy baskets before the defense gets set. Sprinting the floor also opens up scoring lanes for other teammates as well. Read the defense and be able to take advantage of miscommunication or laziness with hard cuts to the basket. Backdoor: if the defender is playing too high in the passing lane, back cut. Face Cut: if the defender doesn't jump to the ball after a pass, cut right across their face. Crash the boards hard and look to get easy put backs. If you are more of a guard, be ready to shoot kick out 3 pointers off of the offensive rebound. Put pressure on the defense and force them to commit fouls. Play under control while being aggressive and don't pick up out of control fouls or turn the basketball over. You must be able to capitalize at the free throw and take advantage of free points. Being able to make free throws at a high percentage adds a lot of value in close games when the other team must foul to extend the game. You must be willing to set up other teammates to keep the defense from collapsing on you every time that you make a move. 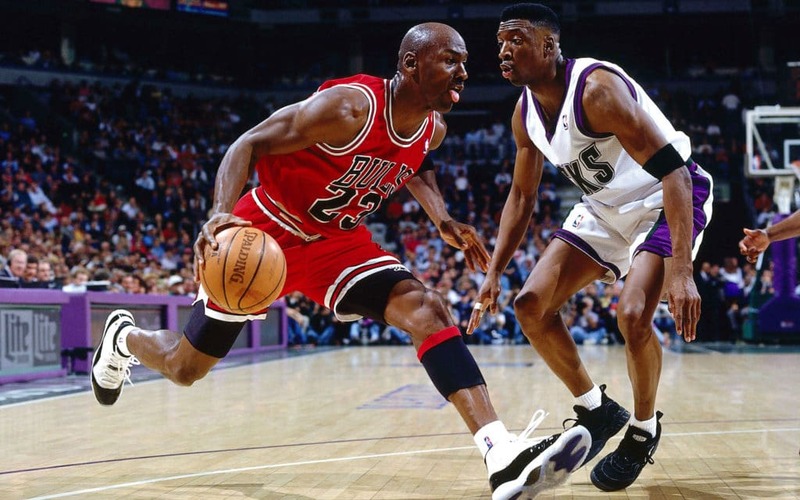 Being a dual threat to score and create puts so much more pressure on the defense. Be able to score in a variety of different ways. You are going to have "go to moves," but you also need to be able to exploit the defense when they are overplaying you a certain way. Example: A guard that is able to both shoot and drive to the basket at a high level,is a lot harder to guard than a player that is only one dimensional. Purposely set time aside to work on areas of your game that you struggle with. Write out what you need to work on and how you are going to improve in those areas. Always be improving your weaknesses and look to turn them into strengths. Work to become a complete player. Getting hands in passing lanes, harassing the ball handler, rebounds, etc. can open up transition opportunities and allow you to turn defense to offense. This doesn't mean gambling outside of team strategy, stay disciplined. Buy into team defense and recognize that defense ignites the offense. Don't be the player that is known as a scorer but takes it easy on the defensive end and hurts team defense. When you hear the word, "scorer" in basketball you sometimes think of it in a negative light because there are a lot of volume shooters out there that we label as scorers. Being a great scorer though means being able to score the basketball efficiently; it is done with one purpose in mind, and that is to help the team win. Great scorers shoot the basketball with accountability. They know that it is their role to shoot a lot of shots and score points for their team. However, they don't just shoot any shot that they want or feel like. It is about the team, and they show that by choosing to shoot high percentage shots. Scorers are usually naturally gifted, but GREAT scorers are also some of the hardest workers as well. If you look at players like Kobe Bryant, LeBron James, Kevin Durant, etc. you will quickly see that they are also some of the hardest workers as well. If you want to develop into a great scorer it starts in the gym with hours and hours of hard work. This is what allows you to shoot the ball with confidence and to take the big shots at the end of the game.